With the 7″ action behind us, it was time to find the bins that had turned my head the last time that I was her; four years ago. It’s hard enough to find the sorts of 12″ singles that are like catnip to me. These days, if record stores have any at all, they are usually hip hop in generic sleeves. The sort of Post-Punk that I seek out is usually a lost cause in most stores, but Wuxtry had a selection of “Rock 12 Inch” bins the last time, and they had been moved in the intervening years. I found them under the LPs, and the first thing in my face was a special record that I already had both UK 12″ers of – “Waiting For The Love Boat” by The Associates. This could be good. 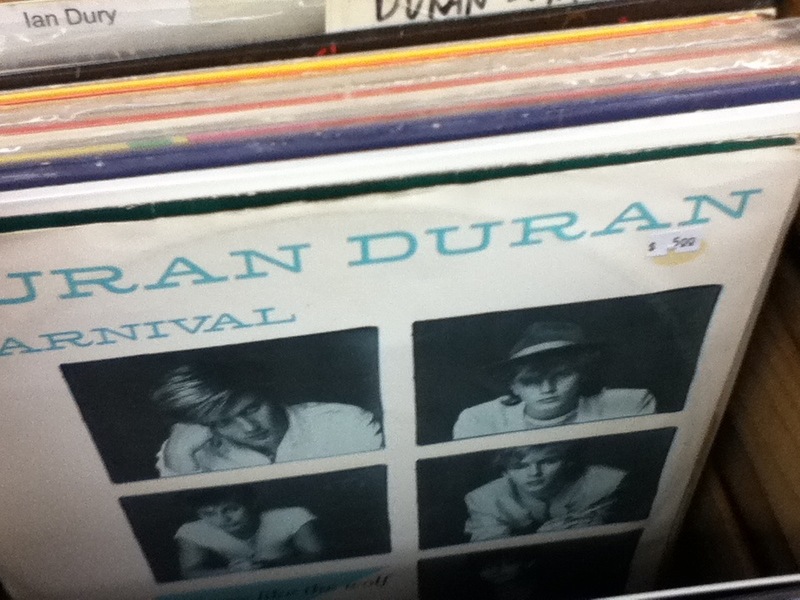 I was making my way through the beginning of the alphabet when I saw a Duran Duran bin card. Though I’m a lapsed DD collector, I still had to look. Old habits die hard. Well, look at that. A Dutch pressing of Duran Duran’s top quality EP “Carnival!” Not the sort of record too widely spread in the wilds. As usual, I was seeing a lot of cherished records that I already owned, but I was certain that sooner or later, I’d run into a cache of “live ones.” Sure enough, it was in the mid-section of the alphabet [P-S] that I struck gold. I found two [two!] 12″ singles from the second Positive Noise Album “Change Of Heart.” One of these was the awe-inspiring “Positive Negative” which I have been dying to hear in a mix longer than the 2:43 teaser-length album cut and the other was “Waiting For The 7th Man.” All I need to make a DLX RM of “Change Of Heart” is the third 12″ single, “Get Up And Go.” [That one goes to the top of the want queue…]. 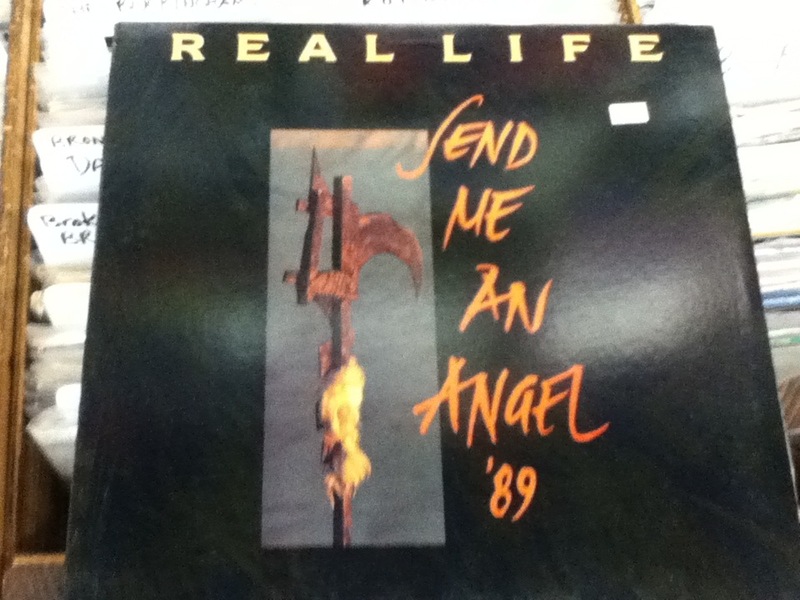 I also found a stray Real Life 12″ with a dub mix of “Send Me An Angel ’89” and of course I bit. Holy Toledo! 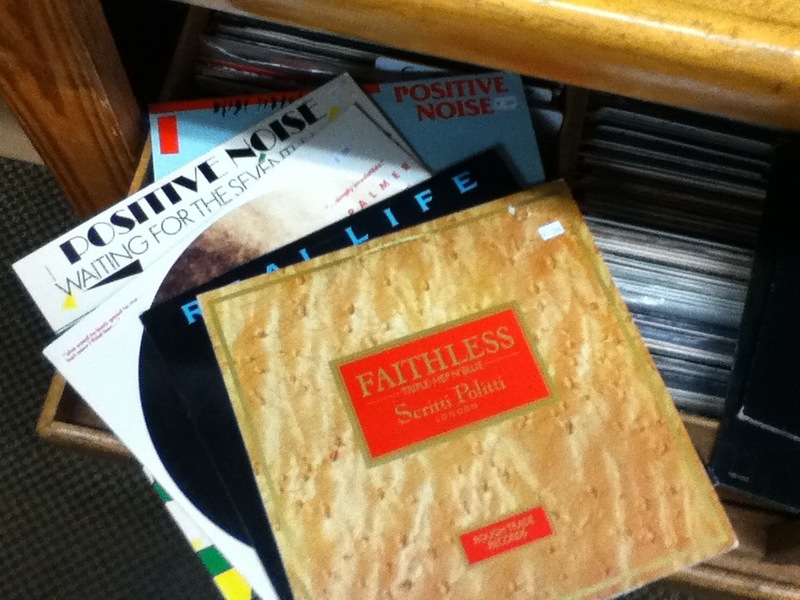 The next thing I saw was the 12″ of “Faithless” by Scritti Politti. The Scritti BSOG gets ever closer, disc by disc. I also nabbed a US only Sparks 12″ of “Pretending To Be Drunk.” I always will spring for a Sparks 12″, given the chance. I did have Robert Palmer’s “Simply Irresistible” but with so many obscure things here, I felt it prudent to put that one back for now. That record should be easy to buy later, though I have been committing to the Palmer 12″ oeuvre this year. I’ve also been focusing on what Nitzer Ebb vinyl to get since I have all of the CD singles. I seem to recall that the US “Lightning Man” had a mix or two of interest. Finally, it was time to hit the LPs. There aren’t too many things that I need on LP but this store was so nice, I felt it was in my best interests to give it a look. Well, well. 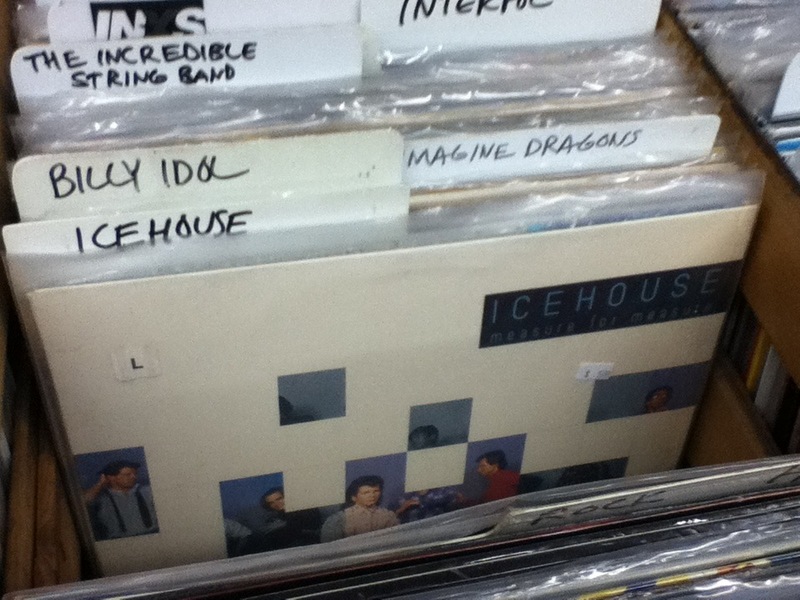 We were just all about Icehouse the days prior to this trip on PPM so I had to look in their section. Lovely to see the US only cover for “Measure For Measure” in evidence. I think I still have my CD of this, since supplanted by an OZ copy [or two]. Since I had the Real Life 12″ from that period, I was still flabbergasted to see the original, 1989 cobbled together LP to exploit that track [successfully, I might add] but with a completely different cover to the CD version in the Record Cell! The version that I bought on CD [probably when it was reissued years later in the format of choice] had a completely different cover with a dwarf and a pooch in a ridiculous setting. I was shocked to find that the LP and cassette formats of this same release had a completely different cover that was a cheap takeoff on the “Heartland” album sleeve. Though Japan opted for the sleeve at left for their CD, unlike most of the rest of the world. Next up were the almighty “S” bins. What treats would I find there? The large Spandau Ballet section was like catnip to me. Sure, sure. I have a far too large Spandau Ballet collection that I can barely justify on the grounds that 50% of it cost me $20 from a single ebay vendor where it was cheaper to buy 16 12″ records for $20 to get the two I needed than to search elsewhere. I glanced at the LPs of “Journeys To Glory as I had stupidly sold off my clean, US pressing when buying the CD in the late 80s. Since the “Journeys To Glory” album had a matte paper sleeve, it is incredibly difficult to find clean, unbesmirched copies of this one this far down the line. Given that it was an embossed sleeve with the statue image in bas relief, I might be interested in a clean copy if it wasn’t too much scratch. I didn’t see any here but I did find two aberrations that caught my collector’s eye. First of all, there was a Yugoslavian pressing that has a crudely drawn and colored image of the statue! It looked awful, but I imagine that Yugoslavian presses just didn’t provide the sort of capabilities we took for granted in the West back then! I glanced at the inner sleeve, complete with Robert Elms poesy. Interesting, but I didn’t bite. Then they had a US LP pressing with no statue image at all on it! A flat white circle surrounded by a Grecian circle! What th…!!! And it was $15.00. A search of the web only reveals this late 80s US CD with a similar cover. I left it for a more dedicated Spandau Ballet collector to find. Finally, I stumbled onto the almighty US pressing of Ultravox’s “Vienna” that was the item to buy and have Mr. Ure autograph a few hours later, so that was a no-brainer. If I had anything autographed, that first album he performed with the band should the the thing. I only had the Yugoslavian copy [again with the Yugoslavian pressings?] back in the Record Cell on LP and that one did not seem right. Finding this was a sign from the Record Shopping Gods. I’m not so dim that I can’t take an obvious hint! By this time, it was twilight and I wandered to the 10″ single area for some searching. I am always on the hunt for the elusive OMD 10″ not on the Record Cell racks – the numbered 10″ William Orbit mix of “Dreaming” from 1988, but it was not to be. 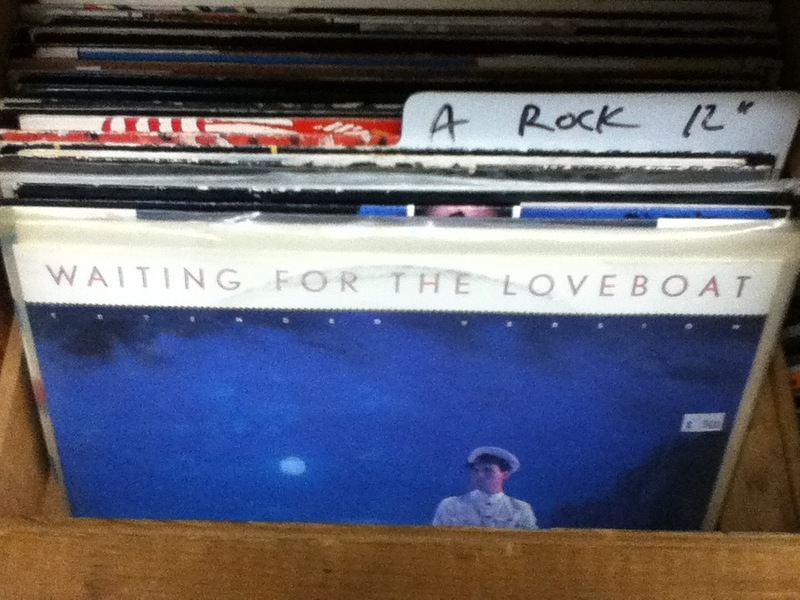 As usual, this shelf of 10″ singles didn’t have that one. They did have the original 10″ pressing of the original I.R.S. 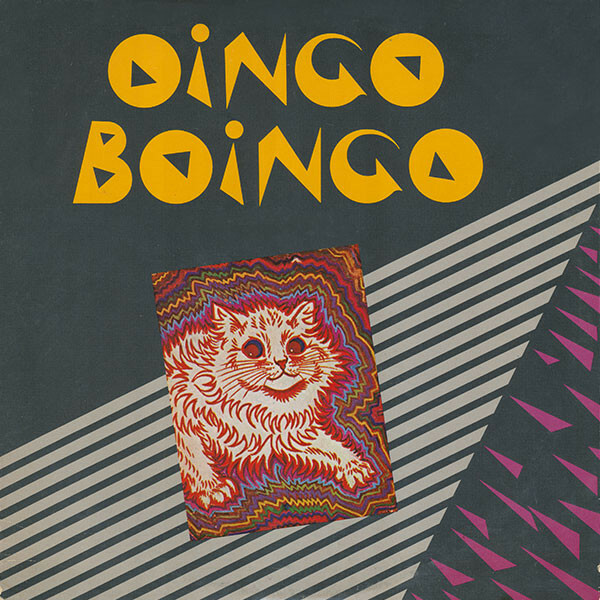 Records “Oingo Boingo” EP with the early version. Not a bad price, either, but I remembered that for the purposes of digitization, the 12″ re-pressing might yield better sonics. Still, this was a holy New Wave 10″ EP and in retrospect, I regret not buying it. At that point, my wife came back into the store, having had a relaxing manicure/pedicure at the nail salon nearby and having found some new clothes. She asked me if I had any more shopping but I was just about wrapped up with the 2+ hours I had spent here this afternoon. I have to say that the store organization, selection, and pricing was best of breed. I daresay this was some of the finest record shopping I’d had since that day in Maryland, 14 years ago. While that day stretched out to five to seven [?] hours where space and time no longer existed for me, at the end of it, I did feel bushed. As I also did in the two largest Amoebas. By contrast, the shopping in Wuxtry left me not only supremely satisfied [$72 has never been so well-spent], but also in a state of absolute relaxation. This I put down to the cozy scale of the store, which could be really shopped in under three hours. The preponderance of want list items was truly superb, and the vibe in the store was most enjoyable. All of the formats that I am interested in [7″ singles, 10″ singles, 12″ singles, CD singles, CDs, LPs] were present and worth the browsing. Had I bought the Oingo Boingo disc, I’d have had an example of each format that I just listed! When visiting Atlanta, I think that Wuxtry should be my go-to store each time, instead of Wax ‘N’ Facts. Little Five Points is getting too much of a Haight-Ashbury vibe and that impacts the shopping. This entry was posted in Record Shopping Road Trip, The Great Record Stores and tagged 2016, record shopping, Wuxtry. Bookmark the permalink. That certainly was some haul Monk! Echorich – I like to think it was a case of quality, not quantity. I think back to the $400-500 not uncommon for me to drop at record shows in the 90s, but I can’t remember ever getting a glow this warm from the activity. Wow…what a great haul! 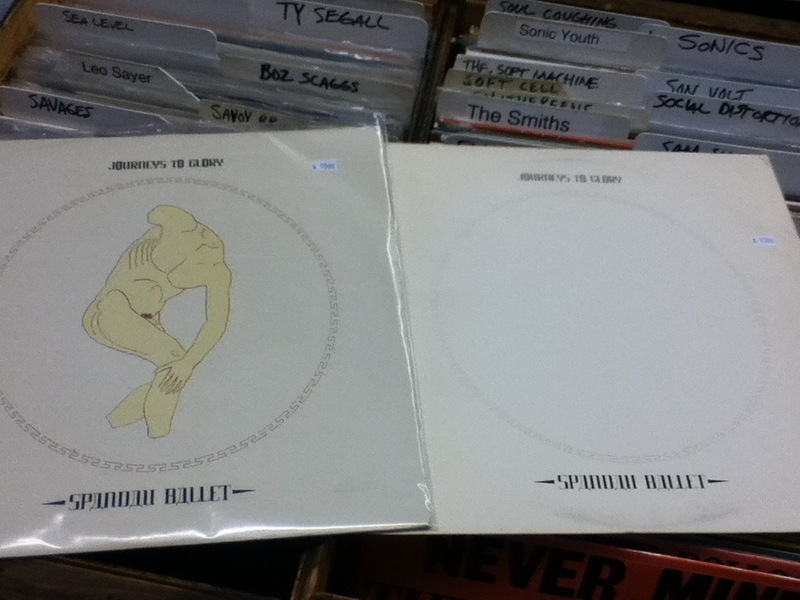 I wish I happened to be passing through Decatur–I’d love the chance to peruse the record bins at Wuxtry! I know I’d find many a release to purchase. Steve – Oh yeah. Anyone with monastic tendencies would be well-served here. Wuxtry Prime in Athens, has the cachet of employing future members of R.E.M. but as good as that store is [and I’ve shopped there on every visit to Athens] I have to say that the Decatur location was much better. chasinvictoria – Ah, but you overlook all of the records I didn’t buy because I already own them! Still fine pickings! That Dutch pressing of Carnival was the only one that I ever saw when it came out, it sold quite well and was regularly restocked by the late indie record store of my hometown (population 50k). I woulda never guessed it was hard to find probably because it was always there when I was thumbing through the bins hoping to find a new 12” single.